Our valuable clients can avail from us a premium quality range of Rotomolding Rotational Moulding Machine that is high on demand in the market. This machine is exclusively manufactured using the best grade components and modern technology in accordance with the set industry standards. Offered machine is easy to operate and available in different technical specifications as per the variegated demands of our precious clients. 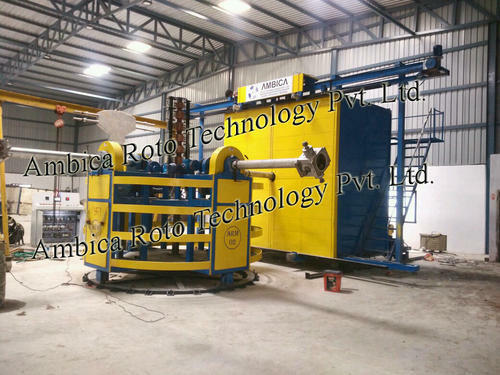 We "Ambica Roto Technology Pvt. Ltd." are actively engaged in manufacturing and supplying a comprehensive assortment of Rotomoulding Machinery, Bi-Axial Rotomoulding Machine, Shuttle Type Rotomoulding Machine, Rock N Roll Rotomoulding Machines, Playground Rotational Mould, Septic Tank Mould, Dustbin Mould, Blow Water Storage Tank Mould, etc. Under the guidance of our Director, "Mr. Dharmendra Panchal", we have gained enormous achievement in this sector. Incorporated in the year 2012 at Ahmedabad (Gujarat, India), we have constructed a huge and ultramodern infrastructural unit that is the backbone of our company and assist us in the production of the best class moulds and machines in numerous specifications. Cover over a large area, this infrastructural unit is systematically divided into several departments such as admin, R&D, quality testing, production, procurement, sales, and many more. These sub-units are handled by highly experienced team of professionals. Owing to this ultramodern infrastructural base, we have been able to meet the several needs of the customers within promised time frame.